Managing IP’s next webinar, run in cooperation with Birch Stewart Kolasch Birch LLP, will take place on April 16 at 4pm (eastern standard time); 1pm (pacific standard time) and will discuss ‘Pitfalls in Post-Grant Proceedings’. With the passage of the America Invents Act in 2011, the number of filings for USPTO post-grant patent trials has dramatically increased. 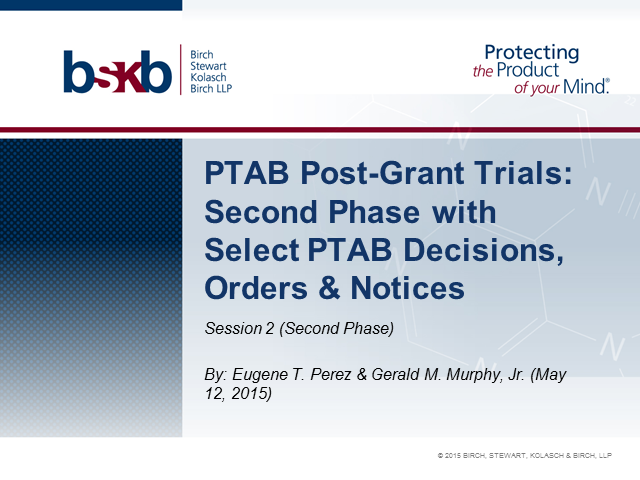 Whether it is an inter partes review, a post-grant review, or a post-grant validity review of qualified business method patents, each PTAB trial has procedural pitfalls with considerable strategic considerations, even before the PTAB makes an institution decision (also known as the First Phase of the trial). This webinar will explore the most common mistakes for the third party petitioner and patent owner made during the 1st Phase, with an explanation of key decisions by the PTAB (including those posted on the USPTO microsite) as well as the Federal Circuit. The focus will be on the real party in interest requirement (including privity), joinder and claim construction (interpretation) using the broadest reasonable interpretation standard. With post-grant proceedings becoming increasingly popular, having an in-depths understanding of the pitfalls and challenges is essential for sustaining a strong presence in the market place. The live audience will be able to ask questions of the speakers during the webinar, which will be in English and will last one hour. Also, don’t forget to mark your calendar for May 12, when we will follow up with a second webinar on ‘Pitfalls in Post Grant Trials’.